The Hooktheory Blog – Write the music you always wished you could. The Band Editor can now be toggled in and out of persistent view, making it easier to simultaneously tweak the band and the music, as shown below. In addition, the Band Editor can now be vertically resized to show more or less content, as shown below. Magic Chord now shows chord-use data, displaying examples of songs that use the suggested chord in the same context. Magic Chord and Magic Bass choosers now have buttons for previous chord, next chord, audition, cancel and accept. Magic Chord and Magic Bass choosers now drop down from the top and don’t cover the score. Hookpad’s Magic Chord lets you ask Hookpad what it thinks is the best chord to use in a given situation. Hookpad scans > 10000 songs and shows you what other other artists have done in the same scenario. Hookpad 2.1 has many improvements to exporting, summarized below. Score export now exports landscape. MP3 export now adds exactly 1 beat of silence before export region to facilitate syncing in DAWs more effectively. Score export adds instrument names to staves. Score export now only exports one consolidated melody per lead voice rather than one stave per lead instrument. The Lyrics Editor can now be resized and lyrics can be ignored using block-style /* */ comments. Keyboars shortcuts for Copy, Cut, Paste, Undo, Redo, and Select All operations now work with command ⌘ (macOS) and ctrl (Windows), e.g. ⌘C for copy, ⌘V for paste. 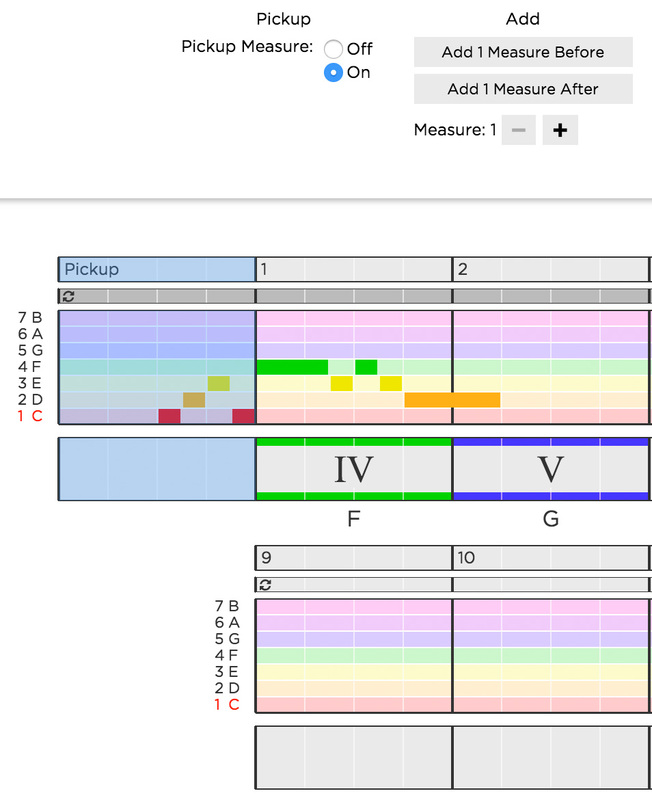 A pickup measure can now be added to Hookpad projects by selecting the measure staff and turning on the pickup measure, as shown below. When a pickup measure is added, subsequent lines of music are shifted to the right by one measure. You can use Hookpad for free right in the browser (there is nothing to install). Go here to try Hookpad or click the getting started link at the bottom of the page. In existing software for writing music, beginners often don’t know where to start. It can be really intimidating. Even for experts, existing tools lack awareness of how music is structured. Hookpad solves these issues by building in concepts from music theory to create a tool for writing songs that is more approachable for beginners and more useful for experienced songwriters. The Hooktheory team sat down for an interview with Christopher Sutton on the Musical-U Podcast. We had a great discussion about Hooktheory, our thoughts on music theory, songwriting, and much more. Check it out! We recently released an update to Hooktheory I: Music Theory for Songwriting. It mostly involved format changes and minor copy edits. However, a small section on pedal harmony was removed from the chapter on inverted chords. We thought we’d post this material to our blog for all to benefit from (and so that previous owners of the web version still have access to the content). Enjoy! Chris Sutton and our friends over at Easy Ear Training recently published in-depth reviews of Hooktheory’s two books, Hooktheory I and Hooktheory II, that teach music theory and songwriting concepts in a simple, intuitive way, without sheet music. Thanks for the positive and in-depth reviews, Chris! Incidentally, Hooktheory has some basic ear training exercises, but we highly recommend Easy Ear Training as well. They have a ton of great resources in this area. Would a hit song written in a major key still be a hit song if it were written in a minor key instead? You can be the judge. When an artist begins writing a new song, one of the first choices they must make is whether to write in a major or minor key. Songs in minor have a fundamentally different sound from songs in major. Today we’re introducing exciting new features in our songwriting software, Hookpad: instruments and mixing, improved MIDI export, WAV export, and the ability to save a song to your local drive. Read on to learn more about the features or try them out in Hookpad now. Today we are announcing several big new features for our songwriting software, Hookpad: MIDI export, sheet music export, guitar tab export, magic chord, lyrics, recording, and live MIDI input. Last week, Ryan was called in as the resident popular music theory expert to discuss the “songs of the summer” with Marty Moss-Coane. Also part of the discussion was Bonnie McKee, the songwriter behind eight #1 singles in the US, as well as Dan Deluca of the Philadelphia Enquirer. Hooktheory was recently interviewed by the nice folks over at Easy Ear Training. It’s a great interview that talks about our backgrounds, the philosophy of the site, and how we got started. I recently stumbled across John August‘s podcast, ScriptNotes, and thought this was worth sharing. For those of you who don’t know who John is, he’s the screenwriter behind Charlie’s Angels, Go, Corpse Bride, Charlie and the Chocolate factory (the one with Johnny Depp, not Gene Wilder) and bunch of stuff you’ve almost certainly heard of. It turns out he’s a Hooktheory fan. …And he wrote a really nice review that made me smile. Thanks John! (if you’re into screenwriting and movies check out his podcast). Last year, we discussed the first results of a long term effort to study the patterns found in the chords of popular songs. The reception that we got was incredibly positive, and we received a ton of great feedback. Happy New Year everybody. Today we pushed several new features to Hookpad that we hope you like: time signatures, modes, and looping. A statistical study of inversions (slash chords) in popular music. This article is Part 3 of a multipart series looking at the statistics gathered from 1300 choruses, verses, etc. of popular songs to discover the answer to some interesting questions about how popular music is structured. Click here to read Part 1. In this article, we’ll continue our exploration into the patterns evident in the chords and melody of popular music. First we will look at the relative popularity of different inversions (e.g. a C/E chord vs. G/B, etc.) based on the frequency that they appear in chord progressions found in the Hooktheory Analysis Database. Then we will take a statistical look at how inversions are most often used. For example, if an inverted chord is found in a song, what can we say about the probability for what the next chord will be that comes after it? This will be compared with how the non-inverted counterpart of the chord is used (e.g. a C/E vs. a C). Author Dave CarltonPosted on October 30, 2012 March 17, 2016 Categories Popular Song Statistics17 Comments on A statistical study of inversions (slash chords) in popular music. The internet has been abuzz recently with reports of the deterioration in quality of music. Of particular note: a recent Spanish study which purportedly proved it, scientifically no less. We want to set the record straight about pop. In this article we’ll respond to some of the common complaints that are being made about popular music and show that, in reality, things just aren’t all that bad. Part 2: I analyzed the chords of 1300 popular songs for patterns. This is what I found. This article is Part 2 of a multipart series looking at the statistics gathered from 1300 choruses, verses, etc. of popular songs to discover the answer to some interesting questions about how popular music is structured. Click here to read Part 1. In Part 1, we used the database to learn what the most frequently occurring chords are in popular music and also started looking at the likelihood that different chords would come after one another in chord progressions. In Part 2 of this series, we’ll continue this exploration into the patterns evident in the chords and melody of popular music. First we’ll look at how popular music ends musical ideas and discuss a surprising difference between popular music and classical music. Then we’ll talk about the most popular chord progression used by songs in the database and discuss the ubiquity of this progression. Finally we will revisit the question of “which chords occur most frequently in popular music” and look at the reasons for why this is the case. Author Dave CarltonPosted on June 27, 2012 March 18, 2016 Categories Popular Song Statistics95 Comments on Part 2: I analyzed the chords of 1300 popular songs for patterns. This is what I found. I analyzed the chords of 1300 popular songs for patterns. This is what I found. For many people, listening to music elicits such an emotional response that the idea of dredging it for statistics and structure can seem odd or even misguided. But knowing these patterns can give one a deeper more fundamental sense for how music works; for me this makes listening to music a lot more interesting. Of course, if you play an instrument or want to write songs, being aware of these things is obviously of great practical importance. In this article, we’ll look at the statistics gathered from 1300 choruses, verses, etc. of popular songs to discover the answer to a few basic questions. First we’ll look at the relative popularity of different chords based on the frequency that they appear in the chord progressions of popular music. Then we’ll begin to look at the relationship that different chords have with one another. For example, if a chord is found in a song, what can we say about the probability for what the next chord will be that comes after it? Author Dave CarltonPosted on June 6, 2012 January 14, 2019 Categories Popular Song Statistics516 Comments on I analyzed the chords of 1300 popular songs for patterns. This is what I found.